Defenders of forest plants? Image: Flickr. Grey wolves are good for wildflowers like the nodding trillium and the Canada mayflower in the Great Lakes region. They’re also good for young red maples and sugar maples. That’s because white-tailed deer are bad for both wildflowers and maple saplings. And wolves are bad for deer. With the resurgence of wolves in the region, smart deer are learning to keep away from areas with many of the predators, meaning that wildflowers and young maples there have a better chance of survival, according to a recent study by scientists from the University of Notre Dame and the Michigan Department of Natural Resources (MDNR). The work took place at Notre Dame’s Environmental Research Center that straddles the border between Michigan’s Western Upper Peninsula and Northeast Wisconsin. The site has forest, bogs and swamps, with red and sugar maples as the dominant hardwoods — a preferred food for deer. In scientific terms, it’s not a question of deer getting smart. Rather, they adapt their behavior in wolf-heavy areas to improve their chances of survival — and incidentally improve the survivability of the maples and forbs, or herbaceous flowering plants. On a practical level, that means deer have adapted by spending less time foraging in “heavy wolf use areas,” the study found. Biologists call the process “trophic cascades.” The phrase refers to “trait-mediated” indirect effects that carnivores — meat-eaters — have on plants by killing plant-eaters or changing plant-eaters’ behavior. In other words, trophic cascades happen when predators– in this case, wolves — kill or change the behavior of their prey — in this case, deer — in ways that benefit the type of plants that deer eat. Plant-eaters can have a major impact on environmental change, including biodiversity and the structure of plant communities, the study said, and the findings may help managers of wildlife and public lands in the Great Lakes region. Historically, wolves were “the natural top predator of Great Lakes deer,” the researchers noted, but hunting eliminated them in the study area by the late 1950s. They stayed extinct in the area until the MDNR discovered a new pack around 2000-06. 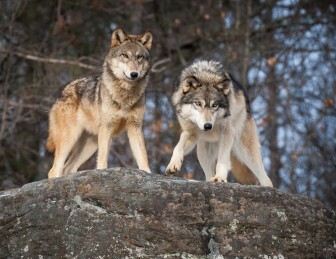 The department’s winter 2015-16 survey found a “minimum population or 618 wolves in the U.P. That’s “a very conservative count,” said Kevin Swanson, a Marquette-based wildlife management specialist in the MDNR bear and wolf program. White-tailed deer populations in Great Lakes forests increased dramatically without grey wolves — a trend with “significant negative impacts on forest sapling growth and forb biodiversity,” the study said. There are no official estimates of the U.P. deer population but numbers are “the lowest for several decades” due to recent back-to-back hard winters, said Swanson, who was not involved in the wolf-deer-maple-wildflower research project. Originally, deer in the region chowed down on yellow birch and eastern hemlock, “but the combination of lingering logging effects and years of deer eating saplings has eliminated a lot of them from the understory,” Flagel said. Maples are “not an absolute favorite,” but once the preferred birch and hemlock are gone, they’re “going to eat something else. Like with your fridge at home,” he said. Differences were dramatic. Deer density was 62 percent lower in high-wolf areas, where deer visits were 82 percent lower and foraging time was 43 percent shorter, it said. And what about the maple saplings and wildflowers? Not surprisingly, deer browsed a significantly larger proportion of them in low wolf-use areas, while the richness of wildflower species “was also significantly affected by wolf use,” the study said. The average richness of the wildflowers increased from 38 to 110 percent in low wolf-use sites. He said, “We have known about deer response to wolves for quite some time, including a1980 study that found increased deer use of areas between wolf territories.” And in a 2014 report on research in the south-central U.P., Beyer and other scientists discovered that adult does avoid core areas that wolves use. If additional research produces similar results, “I would expect that this information would eventually begin to influence forest and wildlife management plans,” Beyer said. A nice paper – my compliments to the authors. And pretty durn good coverage of it written by Eric Freedman too, with nice extra info. And thanks for putting the paper up on a public place – it was behind a paywall for some people when it first came out. I think I’ve noticed where I live (SE lower MI) that the deer used to be of more uniform weight and larger on average (1.5 year-old males were around 135 lb dressed most of the time). Perhaps their favorite wild foods were abundant, thanks to the long period of low deer densities. Now we certainly have higher deer densities, and their favorite plants may be less abundant, so it’s tougher out there. 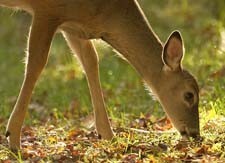 The land may have reduced carrying capacity for deer. So perhaps having too many deer for too long is something you get to pay for later, so hunters, be careful what we asked for.